Do Single Use Plastic Bags get a Bad Rap? Given how short of a time plastic bags are used – from the moment they are loaded with groceries until they get brought home and unpacked – the impact they can have on the environment is so much more lasting. Plastic bags can cause so much damage from simply being an eyesore that floats around neighborhoods and cityscapes, to being a nuisance that can damage animal’s habitats and jeopardize their health and well being. Cleaning up plastic bag litter takes time and money – resources that seem to always be in short supply, and the ramifications of not cleaning up disposable bag litter can cause even more serious and expensive problems. When discarded plastic bags clog canals and drainage systems flooding can result or flood waters caused by storms and inclement will not subside if the system in place to drain the excess water is compromised. Plastic bags are photodegradable – that is they break apart into smaller pieces after long periods of exposure to light, primarily sunlight. The bags will continue to break apart into smaller and smaller pieces that eventually permeate into soil and water. These small particles can easily be consumed by animals who may not even realize what they’re eating since the pieces are so tiny, but regardless they are introduced into the food chain. It is not known what kind of long-term impact these plastic particles will have on the food chain since this phenomenon is so new and it can take generations to identify, let alone really study, the bearings. Despite their shortcomings, disposable plastic bags serve a function: to carry items home from the store. The good news for our planet is that plastic bags are not the only means to achieve this goal. Our reusable grocery bags are an environmentally friendly way to get your purchase from the store to your home without the ill effects brought on by plastic bags, such as litter, damage to ecosystems and potential harm on the food chain. Stop the endless abuse plastic bags cause, and if you haven’t already, make the switch to reusable shopping bags today. 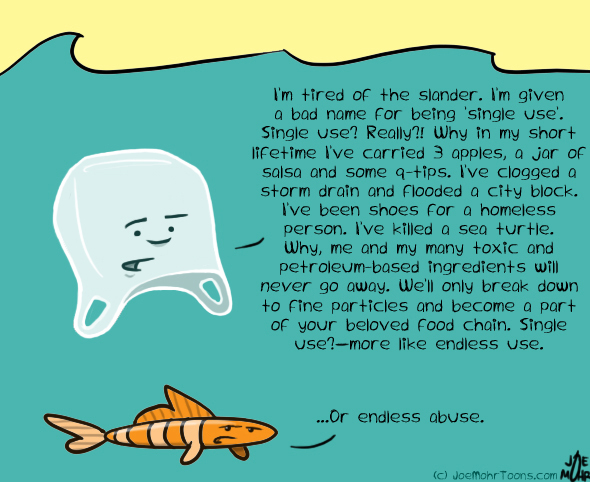 For more environmental giggles, check out Joe Mohr’s Cartoon Archives at http://joemohrtoons.com/2013/02/12/why-so-sad-single-use-plastic-bag/ . Previous Previous post: FactoryDirectPromo.com 2013 Custom Bag Catalog Available Now!